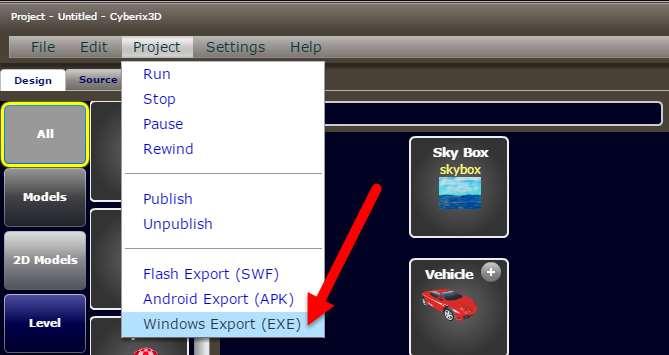 We have added a Windows Export (EXE)! So now you can export your games into standalone EXE files and distribute them as desktop games. The EXE export is still experimental and it has a few known issues that we still need to solve. There is a slight performance issue with the mouse movement on the FPS controller with mouse lock but we will fix it in the next versions. --The mouse movement as you mentioned, except it's not really that bad. I had problems only 2-3 times when waiting for doors to open and it lasted about 3 seconds. --Loading was a bit strange. After clicking the exe windowed-loading bar started, then after it was done there was a pause and then another loading bar in fullscreen started. We have resolved the loading problem and we will work on the icon and fps mouse performance in the future. The exported game is standalone. It will also work offline. can I have the files sold on sites like steam or g.o.g.? Yes, you can sell your games where ever you like, but we are not responsible for any copyright claims or other issues.